We were delighted to be invited by the ISBA (Independent Schools Bursars Association) to attend their Estates Management Seminar held at the Royal Over-Seas League in Central London on 14th January 2015. 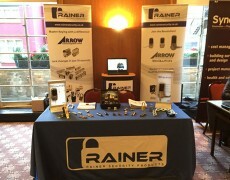 The event attended by over 100 Bursars, Estate Managers & Key Personnel from a wide range of Idependant Schools gave us the opportunity to demonstrate the benefits derived for the use of the Arrow Interchangeable Core Master Key System, Revolution – Arrow’s Touchscreen Digital Lock and Medeco’s XT Electronic Key System. All were very well received with a number of key projects now to benefit from the products and services we offer.